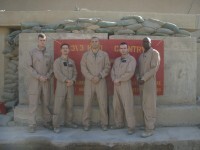 Kilo Command Element, OP Omar, Iraq. December 2007. Haqlaniyah Hotel, May 11 2006. 1st Lt Burke’s position (background) suffers a near-miss from friendly aircraft. 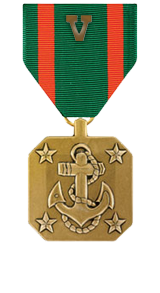 Professional achievement in the superior performance of his duties while serving as 3d Platoon Commander, Company K, 3d Battalion, 3d Marines, I Marine Expeditionary Force Forward, on 11 May 2006, in support of Operation IRAQI FREEDOM. On this date, Second Lieutenant Burke courageously led a dismounted quick reaction force to reinforce a unit under direct fire from the enemy where he coordinated and directed the cordon of the target hotel in Haqlaniyah, Iraq. While effectively preventing enemy egress, and under sporadic enemy small arms fire, he coordinated multiple direct fire engagements. As units occupied positions within 300 meters of the hotel, he coordinated and deconflicted close air support strikes from both fixed wing and rotary wing aircraft and followed up with timely battle damage assessments. His actions to ensure Marines and sailors were in covered positions during the air strikes undoubtedly saved lives when ordnance strayed from its intended target and landed within 30 meters of their position. 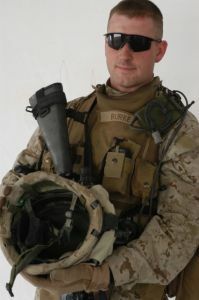 Second Lieutenant Burke’s initiative, perseverance, and total dedication to duty reflected credit upon him and were in keeping with the highest traditions of the Marine Corps and the United States Naval Service.